Glenn and I are excited to announce the March 15 release of Revolutionary Agreements – second edition — and a 25% discount if you order this week. To receive your special discount, click here by March 20, then “Add to Cart” under the book cover, and enter this discount code: HFTLAW69. What’s New in the Second Edition? 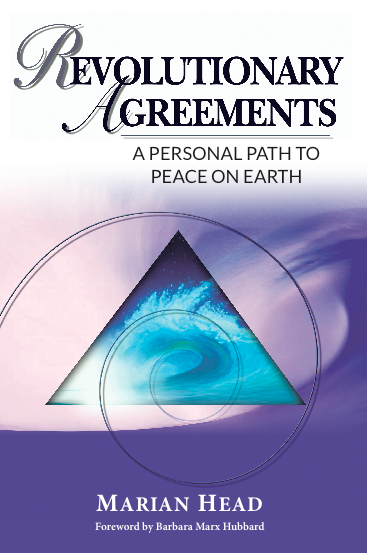 In the ten years since Revolutionary Agreements was first released, thousands of people have benefited from its teachings – and many of their stories are in this second edition. I, too, have grown this past decade while using the Agreements. I wrote this second edition to bring these new insights to you. Evolved Thinking The change of subtitle reflects both my own and the book’s evolution. The first edition was Twelve Ways to Transform Stress and Struggle to Freedom and Joy. The second edition is A Personal Path to Peace on Earth. Feel the difference? 12 days – 12 months – 12 Agreements! By calling in one of the 12 Revolutionary Agreements on each of the first 12 days of 2015, we set the path for a year of truth, acceptance and gratitude. When you think of garbage, think of us! … with emails asking if we survived the 1000 year rains and 100-500 year floods nearby our Colorado home. Yes, gratefully our home was spared. However, our 22-year old son, Michael, is not allowed back into his water-soaked condo for a few more weeks. And as a volunteer EMT/Firefighter, he has been on the front lines saving lives … and sometimes unable to. My longtime friend and business partner, Gail, has been without electricity, water, internet, and phone service since September 13. Her family is safe, but her home now sits on a cliff with a river running in front of it. 9/11/13. Gail looking toward her house which was about 30 feet from her garden. Small creek 100 yards beyond. 9/13/13. Gail's house is now on a cliff with a roaring river at its base. 60% of her land is gone. The community has rallied. Newly homeless people are moving in with families who have opened their homes (and hearts) to them. Gail’s neighbors are moving rock from their quarry across the new river to shore up the cliff upon which her house now resides. Goodness abounds! On a beautiful Sunday in Kauai, our friend Marko offered to teach Glenn, visiting friend TC, and me how to paddleboard. At 62 years old, I was astonished at how easily I knelt on the board and paddled my way out to the middle of the Wailua River. When I felt ready, I put my paddle down across the board in front of me, put one foot at a time in place and stood up, careful to balance my weight so I’d keep from falling. Ah, sweet success! I cautiously paddled up the river, proud of my achievement. I didn’t shift my weight for fear I’d lose my balance, so I held still in my victorious (albeit stiff) position for about 1/2 hour. When my friends took a fork in the river, I followed. Noticing that they had returned to a kneeling position, I wondered if I should also rest in some way. I thought, “Will I get too tired to return?” At that moment, Marko said, “Here’s where your friend Bill fell in.” In a nanosecond, my fear of falling intensified and I fell headlong into the cold river. Today at 12:12, it will be 12:12 on 12/12/12. Some see at it as a special moment in time that won’t repeat until 100 years from now. I am reminded that EVERY moment is a special moment in time that will never be repeated. May we experience love in every moment. Do you ever notice where words lead you? It’s fascinating! As leaders we choose words that inspire and engage people to create a better life and world. I’ve been noticing lately that some words mis-lead me. (1) A young man with a clipboard accosted me in the airport asking me to sign a petition against something. I asked sincerely, “What are you for?” He stopped his ranting and was dead quiet. Then he started up again saying, “It’s important that we STOP this.” I told him I’ll work for certain things, not against them. He still couldn’t identify what he was for and thus was unable to lead me! (2) One of my favorite authors wrote a list of nine outcomes he’d like to see when we co-create the world anew. Five of the nine started with “An end to…” which directed my attention to the ends of his bullet points, including: death by starvation, systematic environmental destruction, and mass exploitation of people. It left me feeling disheartened. I was shocked when one of my business partners said, “Our business is so easy, fun, and rewarding!” Fun, yes. I love working with my friends. Rewarding? Oh, yes. We save lives every day. But EASY? No way. “Really?” I asked. “You think this is EASY? “Absolutely,” she replied. We do the same work. She thinks it’s easy. I think it’s hard. What’s going on here? Perhaps I could have gone to a therapist for a few months and uncovered all the hidden (and not so hidden) messages about the virtues of working HARD that I learned from my hard-working parents. Maybe I would have discovered that the harder I work the more value I think I give to the world. Or that I feel accepted and appreciated based on my sweat-factor. Since I claimed my desire for “Success-by-Magic” all sorts of resources have shown up to help me. Dianne Collins’ new book, Do You Quantum Think? and her husband Alan’s coaching is at the top of my list. Their bottom line: our intent creates our reality. Intent. Prayer. Gratitude. By whatever name, whatever we focus on–consciously or not–is what we get. This morning, the following passage showed up while I was reading Deepak Chopra’s book, The Spontaneous Fulfillment of Desire. It confirmed for my sometimes-skeptical mind just what I’m learning from Quantum Thinking. When you are finished reading this passage, I hope you’ll be smiling with me! Yesterday my brother spent the day with mom and called me more than once to vent his frustration. “She asks me the same question over and over even though I just answered her!” he exclaimed. I asked, “How is she feeling?” “Great,” he replied. During the six weeks I spent in Florida this winter, I visited mom every day or two at her retirement center. I must say I haven’t seen her this content ever. She is truly enjoying her every moment. Is enjoying life more and stressing out less among your New Year resolutions for 2012? “The Agreements are the best tools for stress reduction I have ever found,” said Dan, Director of Systems and Development. At the time Dan was introduced to the Agreements he said, “I was seriously wondering how long I would last under the present tumultuous conditions.” Seven months later he told us, “I am in love again with my career.” Find out why. Stay connected with Marian and Glenn by opting in to our email list below. ©2015 Revolutionary Choices. All Rights Reserved.